Home Cabinet & Countertop Blog Backsplash….Backsplash….BACKSPLASH! Backsplash…what is it for? It’s purpose is to protect the walls of the kitchen from liquids (like water). BUT, it also can serve as the focal point of your kitchen. A backsplash can showcase your personality, style and pull the kitchen together. Most importantly, your backsplash should make you happy. It is important to remember that your backsplash has to blend with the existing decor. There should be a harmony from the work area all the way to the floor. Color and texture is very important to the aesthetics of the kitchen space. Need some inspiration? 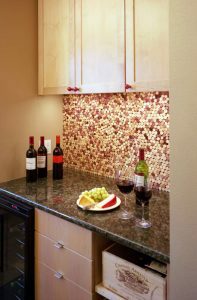 Check out Sebring Buildings article, “71 Exciting Kitchen Backsplash Trends“.